Look No Farther - You've Found It! I'm sure we can all agree that earning money - big money - online is not only possible, but that it is being done each and every day. But, there are always variables... things that have to be done regularly to make that big money. Otherwise, the cash flow dwindles or stops. ...Would we have your attention? As a matter of fact, this method is unlike anything that you have ever seen before! The best part is that it's dead easy to set up and repeatable over and over again. We know...we know... You've heard it all before, right? 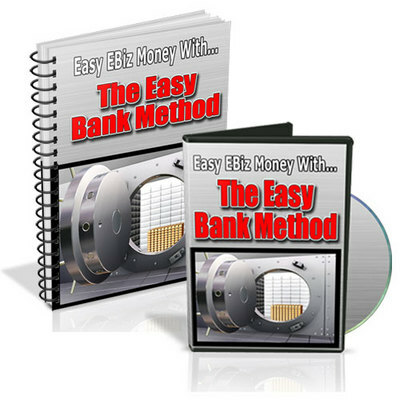 So, what exactly is The Easy Bank Method? The good news is... it does not require you to go door to door to business owners, begging them to let you build them websites or do SEO work for them. In fact, you will never leave your house! It does not require you to cold call business after business either. This method can be set up without making one single phone call. Even if you have no experience online at all, this method will work for you. Even if you have never talked to one single business owner, this method will work for you. Basically, if you follow the steps that are outlined for you, this will work for you! Q.) What are the start up costs? Q.) Is this scamming people? Q.) Do I need to buy any software to make this work? Q.) Is it really as easy as you have made it sound? Q.) Can this method be over saturated? This is a money maker plain and simple - no question about it. The only question here is whether you are going to be the one making the money or not. If you want to cash in, you will want to jump on this right away and implement this method immediately.